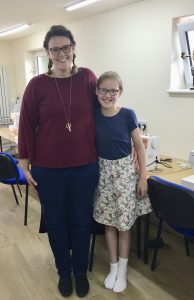 Daughter Janie Hardman and mum Keren have just attended two sessions of the ‘mum and me’ sewing class and share their experience below. 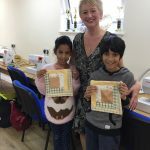 Attending the ‘mum and me’ class was a thrilling experience, I loved every minute. 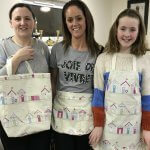 Before I went to Janet’s workshop, I had made some simple cushions and mini drawstring bags, but I’d never used a pattern before. On the day I was so excited because I was going to make my first piece of clothing. 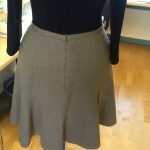 We used a skirt I already had as a template and Janet showed us how to make a pattern out of it. 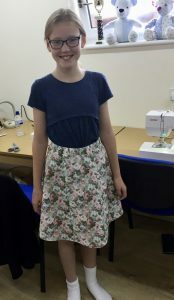 By the end of the workshops I had used a sewing machine and an overlocker to create my cotton skirt. As soon as I stepped through the door everyone said hello and was really nice to me. 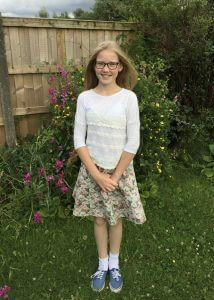 When I had made my skirt they were all really encouraging and said how good it was. 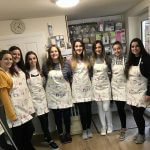 Janet was always there to help us when we needed it and when she was helping others she called us over to have a look so we could learn from what they were doing. It was so good I can’t wait to make another skirt with a different type of material and have booked my next workshop already! 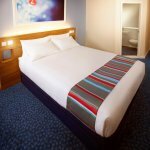 ….. now for a professional hem finish. mum and me after our workshop! 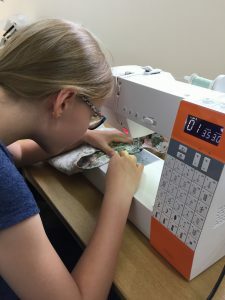 I booked Janie and I on the ‘mum and me’ workshop, as Janie was keen to progress with her sewing and I have limited knowledge. We both really enjoyed it and learnt a lot. It was lovely to have time with my daughter and see her progress under Janet’s tutelage. 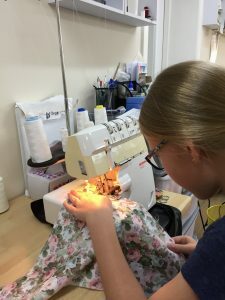 Janet was amazing and really helped my daughter to grow in confidence when using the sewing machine, enabling her to be confident enough, by the end, to use the overlocker. It was also good to work alongside others at differing levels and see what we can do next as we progress further. I can definitely recommend this to anyone at any ability. Everyone there is so encouraging and it’s a great environment to learn in. We can’t thank Janet enough, we had such an enjoyable time, we’re booked in to another session, but I’m sure it won’t be our last! We are piloting a ‘mum and me’ session during the half term break in November. 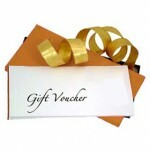 Please complete our contact form quoting ‘mum and me’ to receive details.